Since many children don't eat a lot of fruits and vegetables and have a relatively high-fat diet, they tend to have diets that are low in fiber. This kind of diet can become pretty unhealthy. One of the more common and immediate consequences? Constipation. So how much fiber does a child need in their diet? According to the American Academy of Pediatrics, "a person's daily intake of fiber should equal his or her age plus 5 grams (thus, for a 7-year-old, 7 + 5 = 12 grams a day) up to a maximum of 35 grams a day." Still, many nutrition experts think that isn't enough fiber. The latest fiber recommendations state that kids should eat about 14 grams of fiber for every 1,000 calories they eat. 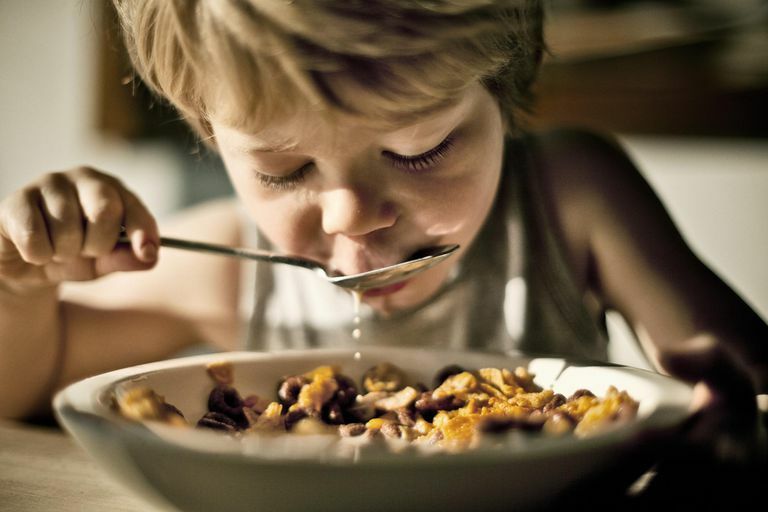 Older kids who consume for calories need to get more fiber in their diet. In general, good sources of fiber include many fruits, vegetables, legumes (beans), breads, and cereals. For any prepackage foods, make sure you are actually getting things that contain a significant amount of fiber by reading the nutrition label. Some foods that are mistakenly thought to contain a good amount of fiber include grapes, melons, granola bars, non-bran cereals, oatmeal cookies, lettuce and apples without the skin on them. A food that is considered "high fiber" would have at least 5 grams of fiber per serving or more. "Good" sources of fiber contain at least 2.5 grams of fiber per serving. Again, don't forget to check the nutrition label to find high fiber foods; avoid adding high-fat toppings to your high fiber foods; and encourage your kids to eat their fruits, like apples, with the skin on. American Heart Association. AHA Recommendation. Fiber and Children's Diets. Institute of Medicine of the National Academies. Dietary Reference Intakes for Energy, Carbohydrate, Fiber, Fat, Fatty Acids, Cholesterol, Protein, and Amino Acids. 2005. Mayo Clinic Staff. Nutrition and Healthy Eating. (2015, October 8). USDA National Nutrient Database for Standard Reference, Release 18. Fiber, Total Dietary (g) Content of Selected Foods per Common Measure, sorted by nutrient content.